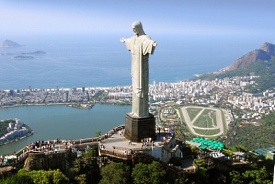 Cruises from Rio de Janeiro depart from fall through spring. Rio is a colorful Brazilian city lined by long stretches of magnificent beaches. It is famous for its annual Carnival, held in the weeks before Ash Wednesday. Passengers who visit during Carnival can be shuttled to and from the port for the festivities. The most popular excursions include cable car rides up Sugar Loaf Mountain, cog train trips up Corcovado Mountain, and drives through the tropical jungle of Tijuca. Driving from International Airport: Follow southwest (160 m). Take the first right, head toward Rd. Itacolomi (23 m). Turn left onto Rd. Itacolomi 88 m. Sharp right on Rd. Itacolomi (1.9 km). Turn right on Rd. Canary Islands (1.9 km). Continue Rd. Galeão (1.4 km). Slight left at Ln. Red / Av. Pres. João Goulart (7.5 km). Slight left at Vd. Prof. Mario Henrique Simonsen (230 m). Continue Ac. p / Av Brazil - High Lane (550 m). Continue to Avenida Brazil - High Lane (1.0 km). Slight left at Ac. p / EVD Perimetral (130 m). Continue Vevd. Perimetral (5.3 km). Take Gen. Justo Av (450 m). Take the exit toward the Avenida Beira Mar (120 m). Turn right on Avenida Beira Mar (85 m). Take the ramp onto Av Gen. Justo (650 m). Continue Vevd. Perimetral (1.8 km). Continue Ac. p / Av Rodrigues Alves (350 m). Continue to Avenida Rodrigues Alves. The destination is on your right (11 m). Driving from Santos Dumont Airport: Follow the southwest Lrg. of World War II Soldier toward Gen. Justo Avenue (50 m). Sharp right at Av Gen. Justo (130 m). Continue Av Alfred Agache (950 m0. Continue Ac. p / Av Pres. Vargas (210 m). Continue Av. Vargas (170 m). Slight left at Av. Vargas - Central Lane (34 m). Turn left on Avenida Rio Branco (1.4 km). Turn left to stay on Avenida Rio Branco (110 m). Slight left at Av Beira Mar (600 m). Take the ramp onto Av Gen. Justo (650 m). Continue Vevd. Perimetral (1.8 km). Continue Ac. p / Av Rodrigues Alves (350 m). Continue to Avenida Rodrigues Alves.